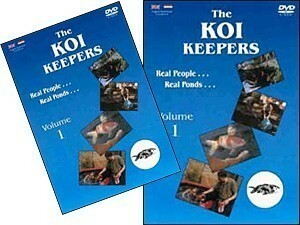 New Vision are proud to present "The Koi Keepers", an in-depth look at 7 fanatical hobbyists and their own pond systems. The programme discusses many aspects of the hobby and features on-screen interviews with the keepers themselves, as they bowl for you some of their koi. This first volume takes a trip onto the continent, where koi keeping has exploded over the last few years, to see the subtle differences in the way Europeans approach the hobby. Each pond featured was built by the owner, proving that the hobby of koi keeping is for everyone. A truly excellent programme, beautifully filmed and presented, "The Koi Keepers" is an inspiration for anyone wanting to pursue this hobby. DVD will play in all computer based DVD drives, and most home DVD players.